Our company has always positioned itself as a "multifunctional trading company" combining the overall strength of a large general trading company with the detail-oriented approach of a specialty seller. As our business has grown, we have never lost sight of our goal of becoming a unique trading company unlike any other in Japan. There were some who urged us to put off going public in the midst of this once-a-century economic downturn, but we saw it through, believing that the time was ripe to come together as a company and make our vision of the future a reality. That experience produced a very valuable result - it gave all of us, managers and non-managers alike, a broader perspective on the management of our company. This public offering will enable us to build trust and expand supply with our customers by fostering public recognition, strengthen our ability to raise funds from the market, and enhance and secure our position as a multifunctional trading company. With global warming, increasing crude oil prices, and China's transition into a consumer nation, in recent years it has become increasingly difficult to secure food produce. Under these conditions, we are working to secure a stable, year-round supply of food produce by establishing supply bases that balance supply-demand requirements and the different harvesting and processing seasons in the northern and southern hemispheres. At the same time, food produce quality control demands are increasing in regards to traceability and residual agricultural chemicals. We are responding to these demands through direct observation of production and other exacting measures to manage and ensure product quality. We also investigate new suppliers, and our meticulous oversight enables us to introduce products with the kind of confidence that earns the trust of our partners. We have built up our business and established a significant position for ourselves in commercial distribution by focusing on fields and business functions that traditional trading companies ignore. One of these functions has become a cornerstone of O'will's operations today: a delivery system that meets our customers' needs. This system exemplified by our pasteurized milk delivery for use in beverages and other foods is highly acclaimed for its safety and accuracy, even over the wide range of products we now handle. We are narrowing down our product lines, conducting inventory sales and renovating our systems to ensure an even more stable supply. The development of new products requires more than just ideas, technology, and market analysis. It requires trial and error, procurement of materials, in-depth communication with customers and, given the constantly changing nature of the business environment, prompt and accurate information. Plus, we believe that active development proposals from a company such as ours, one that is on the front lines in the fields of distribution, procurement and sales, are another important part of the process. It has been less than twenty years since our founding, but we have already supported the development of a great number of new products. We hope to continue contributing to the development of all kinds of products in the future. 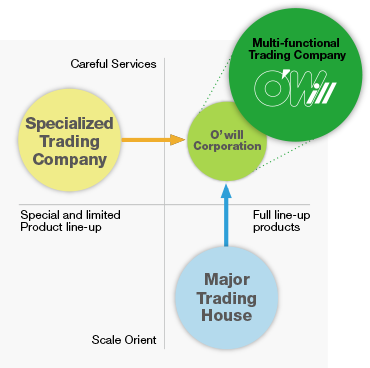 In addition to helping with product development and supplying materials for products that meet customer needs, O'will is also actively developing business activities in the downstream stages of the business cycle. Our forays into the world of retail, through convenience store management and other businesses in the consumer sector, provide us with “living data” that captures the bewilderingly rapid changes in consumer trends and preferences. This data helps our customers develop products. Under our product development support service, we provide proposals for sales systems that include the production of advertising and publicity materials. Since our founding, we have built on our beverage and foodstuffs base and developed a range of new businesses. All of them were created from the ground up, and they took many different forms depending on the customer, and our role in each of these businesses has varied as well. We will continue to meet our customer’s needs, develop latent business functions, and help create new value for customers. Copyright(C) O'will Corporation All Rights Reserved.